The 1820s and 1830s was a very prosperous time for the production of mules and jacks. In 1824, a U.S. Senate Committee took part in the beginning of the Santa Fe Trade. The first mules and jacks of the Santa Fe Route were of Mexican origin. Kentucky soon became the major supplier of mules and jacks. Mules and Jacks started to be put up for sale. Mules were also used as an article of commerce. The Indians were known to steal horses and mules from traders. The first mention of the jack-breeding stock in Missouri appeared in an issue of the Missouri Intelligencer, Jan. 15, 1824. The quaintness of the notice infers that the public was not too educated about the history of mules and jacks. The notice explained how hostile various Indian tribes acted towards hunters. One case told of an Osage tribe and how they attacked Arkansas hunters who were killing buffalo. Another incident occurred where a group of Aricaras attacked six of their own men returning from a trading trip with the Sioux Indians. The Intelligencer promoted the need for the public to take precautions against stealing and attacks by the Indians. During this period, mules also became popular for hauling merchandise and carrying packs. The Santa Fe Trail provided a means for commercial relations between Mexico and Missouri. This process of trade was of enormous economic importance to Missouri. 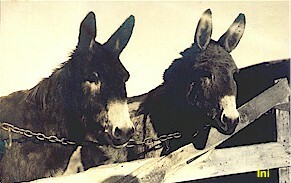 Missouri became known for producing large numbers of mules. Missourians claimed to have greater experience in handling mules than other states. In 1825, a total of more than 600 mules and jacks entered Missouri. The number reached 800 in 1827. And in 1832, the population reached a high of 1,352 mules and jacks. This page was designed by Mindy Burch.